If you’ve never considered a membership community as a way to generate recurring, consistent income for your online business, you should consider it. Especially if you are focused on a niche where passion is a primary motivator. Vanessa Levin is passionate about Pre-K education and it was that passion that led her to create a website that provides resources for Pre-K teachers – and she started the site way back before blogs weren’t really even a thing. As her resources were downloaded more and more, Vanessa realized she was onto something significant, but she wasn’t exactly sure how to leverage it to resource teachers even more AND provide a greater amount of income for herself. 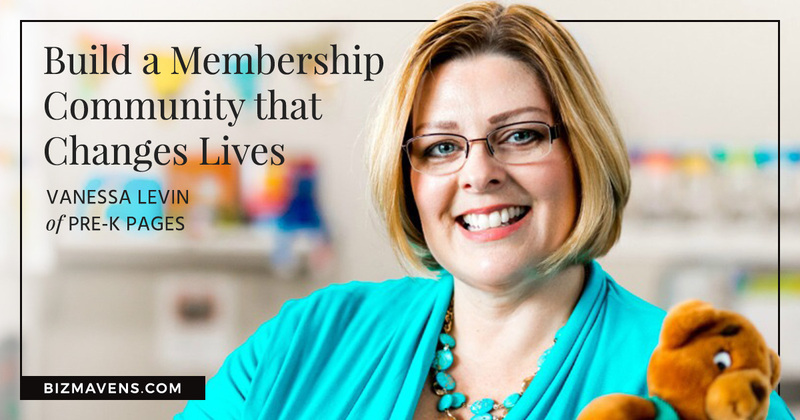 This episode shares her story – and the steps and struggles she’s experienced on the way to creating an amazingly successful membership community for Pre-K teachers. This conversation is as practical as it gets, so I hope you listen. When all you want to do is help is it OK to make money from it? There’s a strange feeling we all get when we realize that money can be made from doing the thing we love. In Vanessa’s case, the thing she loved was teaching Pre-K children and helping Pre-K teachers teach their students more effectively. That’s why she started a website that provided downloadable resources for teachers. When it became clear that the questions her website users were repeatedly asking her could be used to create in-depth resources – and that those resources could be sold for a profit – Vanessa faced a difficult decision. Was it OK to charge for something she was overjoyed to provide anyway? We somehow have the idea that charging money for something we’re passionate about somehow sullies our motives. But Vanessa discovered that wasn’t true at all. What is YOUR passion? What is it that you long to add to the world, or to the niche you want to serve? When you’re passionate about something, it’s hard to imagine not being directly involved in it – but that’s exactly what Vanessa chose to do. Let me explain. Vanessa loved her Pre-K students. She loved teaching them and watching them flourish. But she made the decision to step out of a full-time teaching role. Why? Because she discovered that she could have a greater impact on the children by not being in the classroom. It sounds crazy, but it’s true because Vanessa discovered the power of leverage. She was good at equipping passionate Pre-K teachers and facilitating community among them, which enabled her skills, insights, and experience to be multiplied in a way that it increased the effectiveness of many classrooms, not just her own. Could you do that for your niche? Is a membership community something that would give you an exponentially larger impact on those you are trying to help? I think it could be just what you’re looking for. Listen to learn more. Believe it or not, Vanessa has not always been a fan of membership sites. Her experience with them in the past simply didn’t provide an appealing impression of what they were all about. But she discovered that the power of a membership site is not the gated content and private resources, it’s in fostering genuinely helpful community. The teachers who invest the time and money to become part of her membership community are the kind of teachers she loves working with. They are passionate – just like Vanessa – and do everything they can to help and support each other for the sake of the Pre-K children they all love so dearly. That’s the main focus of any successful membership community – relationships. Your niche could likely use the same infusion of personal care and support, and you could be just the person to provide it for them. Listen to learn more about the incredible impact a successful membership community can have. So glad to see you back. Another inspiring and valuable podcast, thank you Jeni and Vanessa!